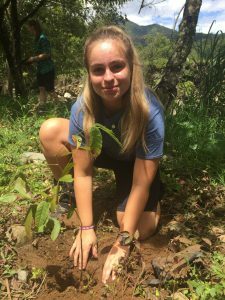 A journey through Costa Rica - an outdoor learning trip like no other. Waking up to the loudest sound in the animal kingdom – a whooping howler monkey, staring upwards at a canvas tent roof, the only thing separating you from the rainforest, is an extraordinary yet perplexing feeling. If you had told me five years ago (or my parents for that matter) that 11 girls and I would fly out to Costa Rica and plan, book, trek, budget, build, snorkel and raft for 24 days, I think I would probably laugh at the sheer ridiculousness of the notion. However, on reflection, it will be one of the most memorable experiences we will all ever have. After having said our tearful goodbyes and consumed mountains of pizza, the night before our adventure really began, the feeling of excitement and anxiety intermingled as we all tried and failed to sleep. As the new day dawned, the reality of our situation began to settle, everything began to feel real as we arrived at Heathrow Airport. Three flights later, we shuffled through Juan Santamaria Airport, climbed into our strikingly orange taxis and drove through the busy metropolitan night scenes of San Jose. Our first day in country was a memorable one, as half of us explored San Jose and the other half began planning our expedition. San Jose can only be described as a culture shock of astronomical proportions, or, likened to being run over by a carnival. The sheer overload on your senses takes time for your brain to comprehend, a city unlike any we had visited before. The next day we travelled to La Fortuna, in the north of the country. For the next three days it became evident we were beginning to settle into the expedition culture. 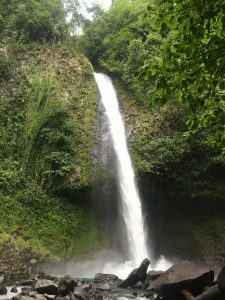 For our first acclimatisation trek we hiked up to La Fortuna Waterfall (in 30 degree heat might I add), our first real taste of what was to come and our first wildlife spotting; although physically challenging the reward immense. The cascading white waterfall was magical to witness, and the cool pool of the runoff was refreshingly welcomed. Our evening meal at the lava lounge was a trip favourite, and our first chance to sample the vibrant local cuisine. The second hike was the Arenal Volcano base in “slightly different” conditions. A contrasting experience yet still equally memorable, we finished our day by relaxing in the local hot springs “Termahlithas” – a group favourite. 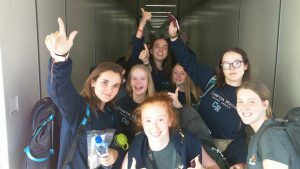 The next phase of our trip was the trek, originally a concept most of the group held trepidation about, however at the end it became a firm favourite and proudest moment. The unpredictability of the erratic rainforest was one of its most endearing qualities, the fickle weather patterns had a major part to play; sunshine to storm in a matter of seconds. The variety of wildlife was second to none, from four different species of monkeys, toucans, bird eater snakes, blue shrimp, bullet ants, poison dart frogs and tarantulas. Although physically demanding, burdened by not only our sizable rucksacks but also the harsh terrain, it only made the achievement of the day sweeter and the arrival at the camp enhanced. Soon began the camp ritual of washing in the river and pitching tents or hanging hammocks, followed by group bonding over dinner and reflection of the day. Our fantastic jungle guides, Donny and Walter, were an excellent addition to the trek, along with the popular river breaks which were a chance to cool off and revel in our outlandish surroundings. However, the best aspect was undoubtedly the finish line, at a sensationally striking rolling black sand beach – a view that will forever be etched into our minds. After the trek, we travelled to Puerto Jimenez – the base town for our R&R and the project. 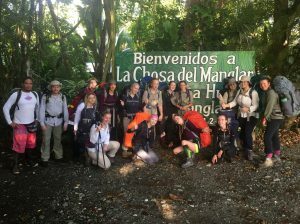 We stayed at hostel “Chosa Del Manglar”, which was bursting with exotic wildlife (welcome and unwelcome). We were lucky enough to be visited by families of monkeys and a raccoon, and managed to work around the thousands of skittish vibrant crabs that were native to the area. Our R&R activity was incredible – dolphin watching and snorkelling. We were fortunate enough to have a friendly rendezvous with a pod of 150 bottle nose dolphins, all exceedingly friendly and impishly spirited. The calm waters of Corcovado National Park were of turquoise transparency and the coral reef was dazzling in appearance; also an important life lesson was learnt – the vital importance of sun cream!! The next phase of the trip was the project – the most anticipated section. Our project was based in Dos Bravos (a 30-minute drive outside Puerto Jimenez). 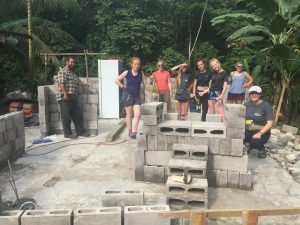 For the next four days as a group we managed to lay the foundations and elevation of a jungle structure for a native of the rainforest. However, the best part of the project was undoubtedly the people we met, whether playing football with children, building with the construction workers or eating a delicious dinner (of rice, beans and chicken) at a local’s house – everyone was exceedingly welcoming. We topped off the phase with a second visit to our favourite restaurant “Pizza Pasta” followed by an ice cream bar which boasted incredible flavours. The penultimate component of our journey was the tree planting phase, in which we travelled to the idyllic town of Santa Maria. Here we planted trees to offset our carbon footprint, followed by a charming traditional meal at our host’s hostel. On our final day as a last hoorah we went white water rafting, an exhilarating and thrilling experience and perfect climax to the trip. Additionally on our journey back to San Jose from rafting we managed to glimpse a sight of the seemingly elusive sloth, the perfect ending. Our journey home consisted of three flights, gift shopping overload and gorging ourselves on the now apparent luxury of MacDonald’s and Starbucks. Waiting for us were our parents at the gate where emotions ran high and the inevitable story telling began. Looking back on my trip to Costa Rica, I will take away from it how privileged we all are and how important everyday occurrences we take for granted actually are (such as being dry or not being infested with bedbugs). But more importantly the memories we made over the span of 24 days are something we will all treasure for life. Take a look at a compilation of just a few of the photographs from the trip at this link.